MOSCOW - Russian President Vladimir Putin, boosted by a landslide re-election win, flexed his nationalist muscles Monday, declaring that he will defend Russia's interests for another six years without an arms race. Putin won his fourth presidential term Sunday with nearly 77 per cent of the vote - his strongest electoral support ever. The result gives Putin new confidence to stand up to the West and deploy Russia's resurgent power on the world stage. "We have no intention of engaging in some kind of arms race," Putin said, speaking at a meeting with his seven defeated presidential challengers in the Kremlin. "Just the opposite, we will seek to develop constructive relations with other countries. We will do all we can to solve all disputes with our partners using political and diplomatic means." The Russian presidential election came amid escalating Cold War-like tensions, with accusations that Moscow was behind the nerve-agent poisoning this month of a former Russian double agent in Britain and that its internet trolls had waged an extensive campaign to undermine the 2016 U.S. presidential election. Those accusations ultimately bolstered Putin at home among those who see him as their defender against a hostile outside world. 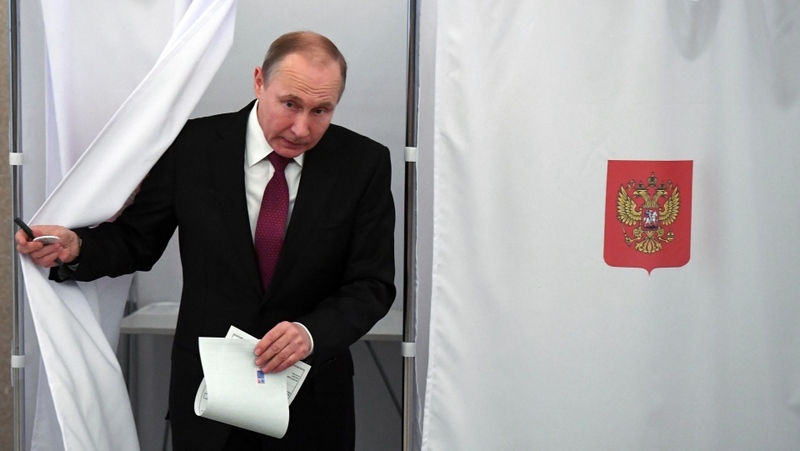 Putin's support at the ballot box, accompanied by a heavy turnout at 67 per cent, marked his best electoral performance ever. In previous races, he won 53 per cent of the vote in the 2000 presidential election, 71 per cent in 2004 and 64 per cent in 2012. With 99.8 per cent of the vote counted, the Central Election Commission said Monday that communist Pavel Grudinin came a distant second with 11.9 per cent support. Third was ultranationalist Vladimir Zhirinovsky with 5.7 per cent. The only candidate to openly criticize Putin during the campaign, liberal TV host Ksenia Sobchak, won just 1.7 per cent. Putin's most serious rival, opposition leader Alexei Navalny, was barred from running because of a fraud conviction widely seen as politically motivated. It's not clear what effect, if any, Navalny's call for a boycott had on the presidential race. Both he and Sobchak, who had clashed during the campaign, were silent Monday, their future plans unclear. Despite the landslide, Putin still faces enormous challenges. He needs to diversify an economy that is still heavily dependent on oil and gas and to improve medical care and social services in regions far from the cosmopolitan glitter of Moscow. Putin also needs to make a key strategic decision: whether to groom a preferred successor or try to stay at Russia's helm beyond 2024, either by scrapping term limits like China just did or by shifting into a new position of power. When asked if he intends to initiate changes in the Russian constitution that could eliminate term limits, Putin answered that he has no such plans "yet." Putin's electoral power has centred on stability, a quality cherished by Russians after the chaotic 1991 breakup of the Soviet Union. But that stability has been bolstered by a suppression of dissent, the withering of independent media and the top-down control of politics in Russia's so-called "managed democracy." That included heavy pressure on Russian voters to fulfil their "civic duty" and vote Sunday in order to maximize the turnout - even though most could accurately tell you who was going to win the presidential race beforehand. Two election observers in Gorny Shchit, a rural district of Yekaterinburg, told The Associated Press they saw an unusually high influx of people going to the polls just before 2 p.m. A doctor in the Ural mountains city told the AP that was the deadline for health officials to report to their superiors that they had voted. Observer Sergei Krivonogov said voters were taking pictures of leaflets that poll workers distributed, seemingly to prove they had voted. Other examples of Russian election irregularities cited by observers or posted on social media included ballot boxes being stuffed with extra ballots in multiple regions; an election official assaulting an observer; CCTV cameras obscured by flags or nets from watching ballot boxes; discrepancies in ballot numbers; last-minute voter registration changes likely designed to boost turnout; and a huge pro-Putin sign in one polling station. Leaders of the observation mission for the Organization for Security and Cooperation in Europe said Monday that the Russian state media's extensive coverage of Putin's activities gave him a significant advantage in the race. "While the incumbent president did not participate in debates or campaigning, extensive and unchallenging news coverage of his official activities continued to provide him with dominant presence in the media," said Marietta Tidei of the OSCE's Parliamentary Assembly. "A choice without real competition - as we have seen in this election - is not a real choice," said Michael Georg Link, a co-ordinator of the observer mission. Sergei Klimov, a 32-year-old resident of Yekaterinburg, said he was forced to go to vote but he ended up spoiling his ballot. He added, however, that he didn't see anyone who could challenge Putin. "It's better to be with him than with anyone else," Klimov said of Putin. "Someone else wouldn't deliver what Putin will deliver." Tsiya Soskina, a 78-year-old retiree in Yekaterinburg, said she did not go to vote because "they're going to decide everything for me anyway." "I don't think we should expect anything good from Putin ... but at least there are no upheavals," she added. Jim Heintz in Moscow and Nataliya Vasilyeva in Yekaterinburg contributed.